The abc-partners meet twice a year to discuss the progress of the project so far and what is next on the „to do-list“. They always meet in one of the partner cities. From 12th to 14th of September 2011 the partners met in Rostock to have a kickoff-meeting with information and discussion about the agenda. The participants started the work in all work packages. 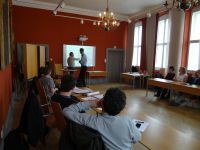 At the end of February 2012 the partners met to the 2nd workshop in Gdansk. They invited Thomas Krag from Copenhagen as expert for cycling and communication. He introduced into the topic of communication to promote cycling. From 15th to 17th of October 2012 the partners met in Kalmar. Every abc-partner reported about the progress in partner cities. It was continued with new informationes and discussions about all activities. Besides the participants took part in a study trip through the Bicycle City Kalmar. From 24th to 25th of April 2013 the partners met in Kalmar. As usual the abc-partner reported about their progress discussed all activities. Directly before the workshop an international think tank workshop was organized about issues and problems of cycling promotion in every abc-city. 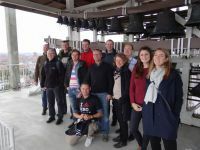 On 11th of September 2013, one day before the 4th Congress of Active Mobility, the partners met in Gdansk and reported about the progress of their activities. The participants took part in the congress and a study trip about the bicycle City of Gdansk. 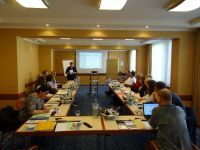 The final meeting within the regular project duration took place on 21st of May 2014 in Rostock.The partners reported about their activities and outputs. The project group discussed how to finalize their activities and disseminate the results. After the meeting the project partners took part in a multimodal study trip through Rostock and joined the conference "Cycling connects". Within the prolongation period of the project the partners met twice together with representatives of some more cities and organizations in the Baltic Sea Region. These capacity building workshops aimed at disseminating the results of the project and exceed the partnership for future cooperation. The first capacity building workshop took place in Aarhus on 9th of October 2014. Denmark’s second largest city has high ambitions to promote cycling and therefore is a good place to learn and discuss about cycling promotion. After a fruitful working session about future collaboration the participant experienced the "Cycling City Aarhus" on a guided cycling tour. The second capacity building workshop was held in Rostock from 15th to 16th of December 2014. 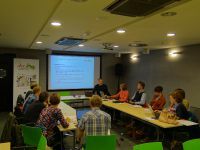 The participants from six countries around the Baltic Sea further discussed a proposal which was based on a brainstorming during the 6th project workshop in Rostock in May 2014. The project idea is called “Urban space – urban mobility”. The participants agreed on focusing on sustainable urban mobility in innercity areas.